For much of my childhood, each September we’d wash our horses, plait their manes and trim their tails, clean our saddles and pile into the truck headed for the Molong show. We were a scruffy bunch, considerably under-polished in comparison to the ‘showies’, as we called them, the neat town kids with extra-shiny boots and well behaved horses. We didn’t mind, we were really there for the magic – once we’d done our few laps around the ring on our ponies we were off to the dodgem cars, flower pavilion and sideshow alley. Agricultural shows are an important point of connection for rural communities – a time to gather and celebrate the people and produce of an area. The Sydney Royal Easter Show is the big daddy of all such shows in New South Wales. It’s where, if you’ve done extra well at your local show, you can pit your horse, cow, wood-chopping skills, scones or wheat against the best in the state. It’s a time for rural NSW to head to the city, and share their lives and loves with the urban dwelling beneficiaries of their labour. Nestled amongst the showbags, dagwood dogs and horticultural stalls, the District Exhibits is a mainstay of the Sydney Royal Easter Show. The competition began in 1900 (incidentally, the same year that showbags were introduced!) and the main pavilion is where the action is. 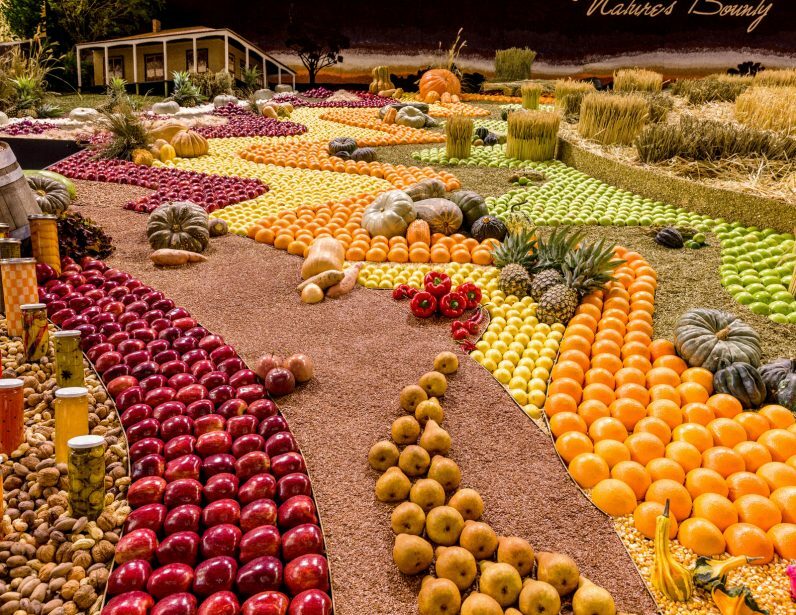 Wrapped around one entire side of it are five huge displays – each highlighting the produce from the different regions of NSW and South East Queensland. The displays are impressive from a distance, but up close they’re mind-blowing. 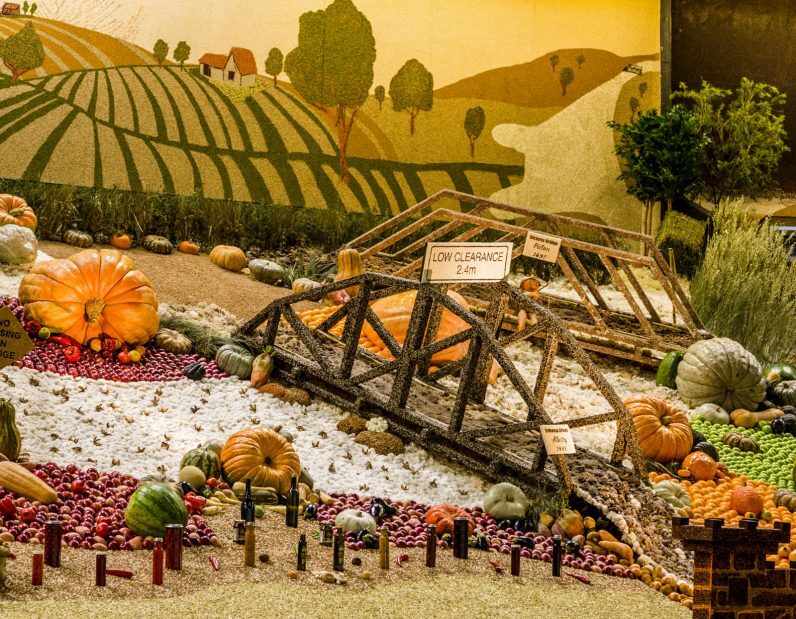 Think picket fences and ducks clad in millet seeds, cascading collections of oranges, apples and lemons, miniature bridges clad in wheat seeds, pears nestled in beds of lucerne chaff. And more, so much more. It’s wondrous madness. 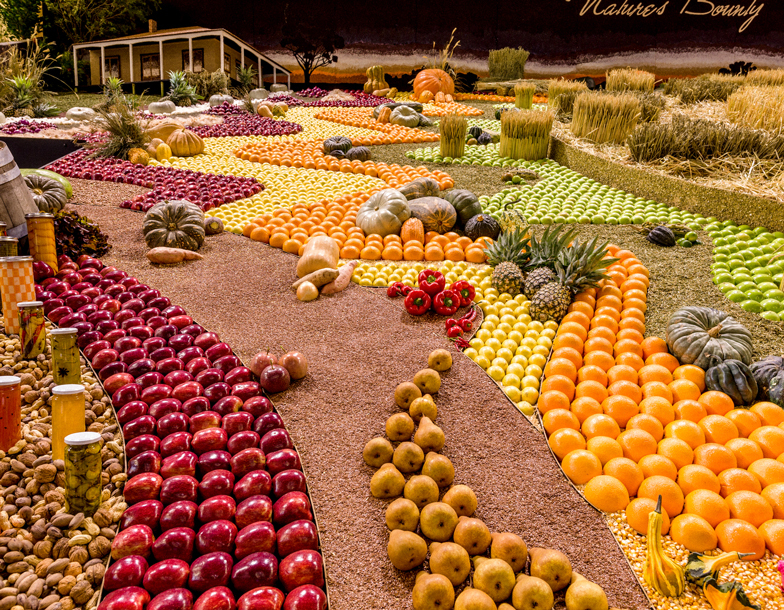 The displays contain thousands of different produce items – each hand-picked, cleaned, polished, and placed over a two-week installation period. 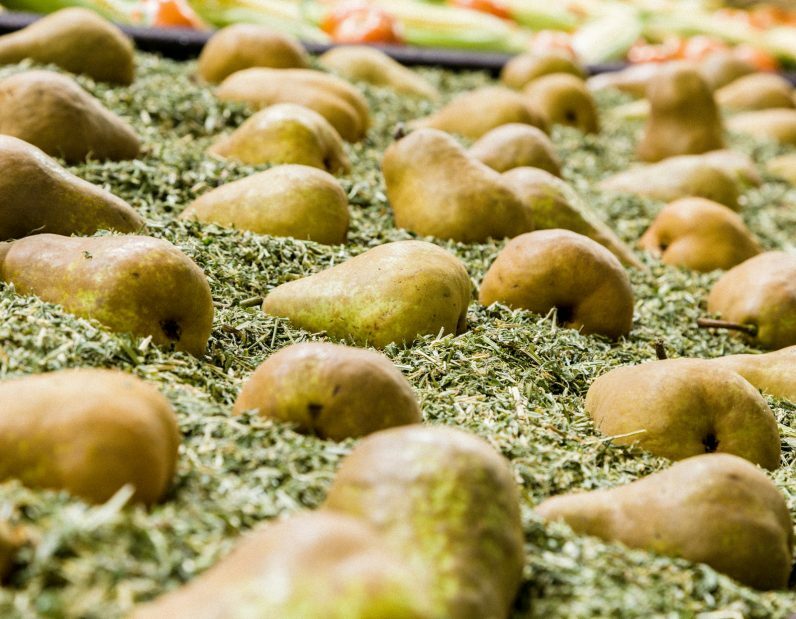 The process itself, however, beings a year in advance – each of the items included in the displays are required to be grown within each region. Someone needs to source the produce, work out the numbers, do the design, gather a team and install the exhibit. 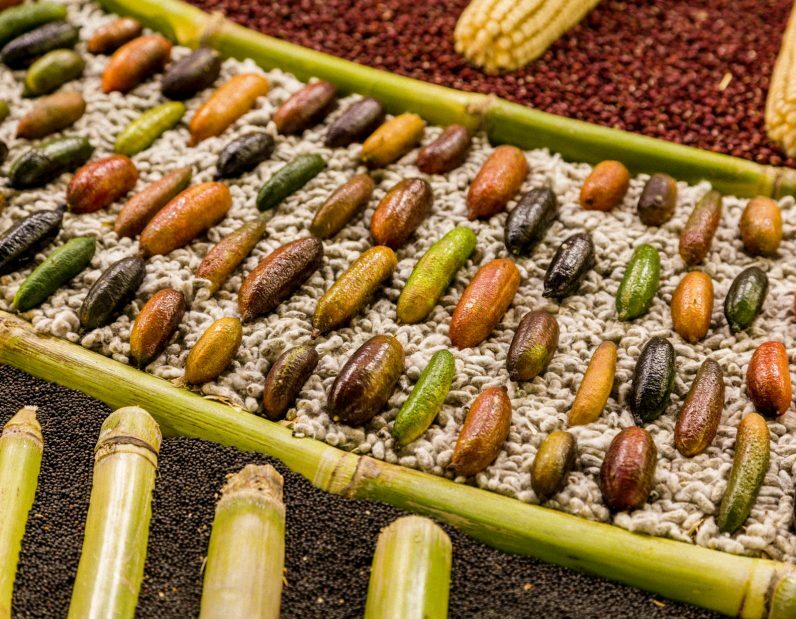 It’s a labour of love, a longstanding tradition and a very fiercely fought competition. We had the opportunity to go behind the scenes this year to get an idea of the work that goes into this most massive of installations. It was such a treat, and whilst we loved seeing the fruits of each team’s labour out the front, we really enjoyed documenting the nuts and bolts, and chatting to the very hard working folk out the back. Each team sets up camp under their display and works like mad preparing their display for judging. 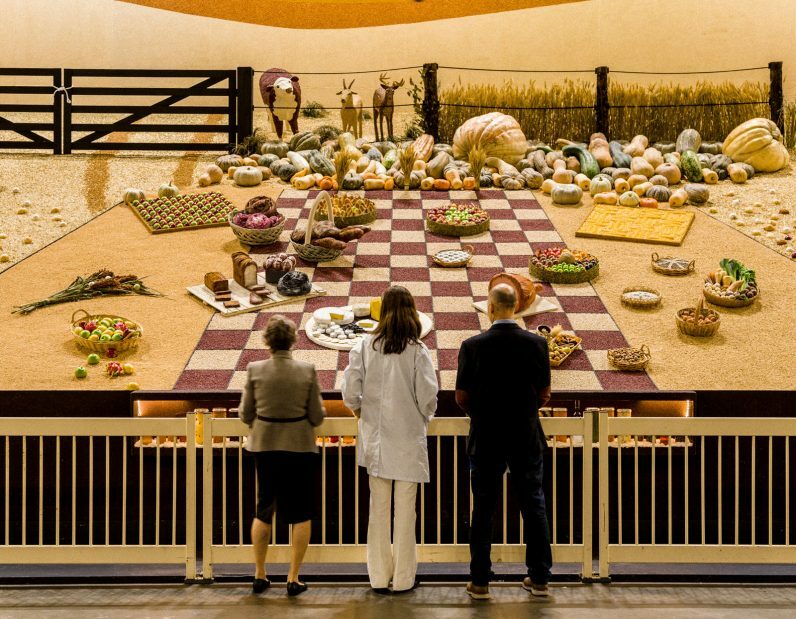 what is usually an empty corner of the main pavilion becomes alive – like a mini city of sorts, with laundries, kitchens, tea stations, dining tables nestled amongst boxes and boxes of grains, fruits, cheese, vegetables and more. Each team has their own designated territory, and it’s only after the judging that the teams co-mingle. Beforehand, it’s all business. I caught up with the very charming Arthur Johns, the manager of the Northern Districts team for a first hand account of the work involved in pulling together a District Exhibits display at the Sydney Royal Easter Show. TPH: Hi Arthur, so you’re the boss of the Northern Districts team? Where are you from? TPH: Are you a farmer up there? Arthur: No, I’m a burnt out farmer. I’ve got an acre of dirt and then I’ve got another acre five minutes away. TPH: What do you do on your land? 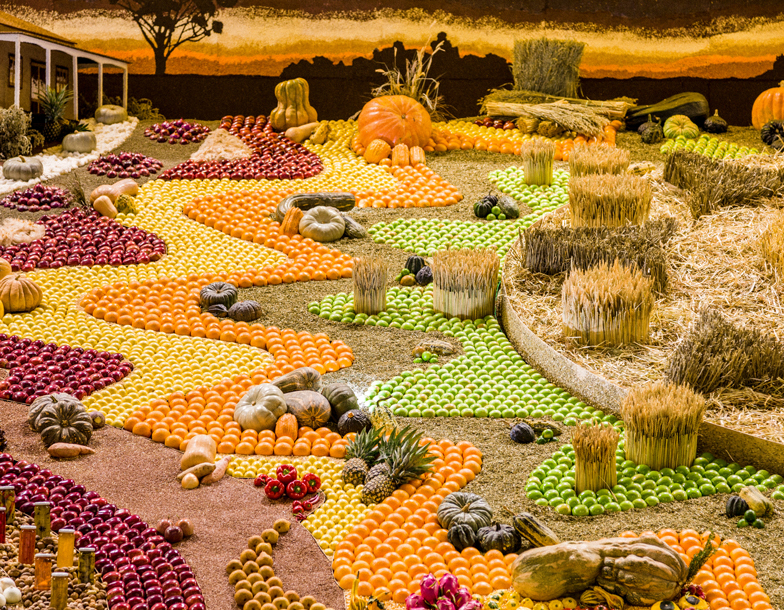 Arthur: I grow the produce for the this, for the district exhibits at the Royal Easter Show. I grow melons, pumpkins, corn, ryegrass, oats etcetera. TPH: How long have you been doing that for? Arthur: 16 years. The whole time I’ve been the manager. TPH: Do you mind if I ask how old you are? Arthur: I turn 74 in two or three months’ time. I’m too old for this trick. TPH: Do you reckon you are? TPH: Are you going to do it next year? Arthur: Well, they’re pulling a swiftie on me, giving me a 25-year service medal so I’m going to have to do it. I told my committee when I turned 70, I wanted out but they haven’t up with anyone who’s got the time or the rural knowledge to take it on. It’s a 12 months of the year job, it’s very time consuming. You’ve got to get someone retired like me whose got time to do this. I wouldn’t know how many hours a year I put into it. TPH: You must love it, do you? Arthur: I love it. I haven’t been well the last two years, I’ve had cancer and I almost gave it away. My eldest son and wife said to me, “What do you do if you give it away? You’ll go stark raving mad.” So, it’s really helpful, what they’ve done, and I’m hoping to get well out of it. And I think I will. TPH: What bit of it do you like the most? Arthur: I like being out and about. Being an ex-farmer, I like being out in the big grain growing areas, collecting for the show. I also love the competition. I’m a pretty fierce competitor. I’ve won for the last 9 or 10 years. TPH: Wow. So, you’re the reigning champion. Are you the guy that everyone wants to push off the perch? Arthur: I’m the one. They’re all after me. They’re all snapping at my heels. They’re all here to beat me. Tom Dwyer, manager of the Western Districts team.